Rumble in the Jungle this was not. On one side: Paul Ryan, who said he’d only run for speaker of the House if Republicans were unified, open to reforms, and respectful of his family life. On the other: the House Freedom Caucus, which had influenced John Boehner’s decision to retire and Kevin McCarthy’s withdrawal from consideration. The Freedom Caucus had a reputation. Combative, aggrieved, empowered. And supportive of Ryan. Even the persnickety Justin Amash of Michigan endorsed him. That adversarial relationship between "conservatives" and "leadership" we had heard about for so long? It melted away. The encounter between the Wisconsin congressman and his colleagues wasn’t a fight. It wasn’t a negotiation. It was unification. 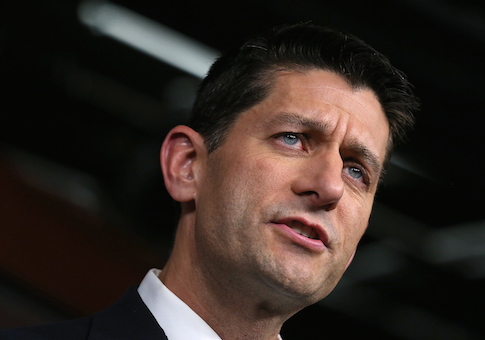 Now Ryan is on track to become, according to National Journal, "the most conservative House speaker in recent history." But Ryan is more than his voting record. The speaker he reminds me of most is Newt Gingrich. Not personality wise. Leadership wise. Both men framed the argument for their party long before ascending to the speaker’s chair. And if Ryan, like Gingrich, becomes speaker, we’re not talking about a mere transfer of power. We’re talking about a revolution. The story begins in 2008. The GOP was approaching a nadir—unpopular, exhausted, in the minority. What did Ryan do? He authored the first version of his budget, the Roadmap for America’s Future. He called for spending and tax cuts, changes to Social Security and Medicare. He became the unofficial GOP spokesman for free markets and fiscal restraint. No one ordered him to do this. He alone among House Republicans took the initiative, much like his hero Jack Kemp had done in the 1970s. You might disagree with Ryan’s ideas—Lord knows I have my differences—but you can’t deny his courage to stand in the public arena, his commitment to his program, his readiness to defend it. The GOP moved toward Ryan. In 2010 he updated the Roadmap and submitted it to the Congressional Budget Office for analysis. His colleagues were curious about the plan, how to discuss it with their constituents. Ryan taught them the details. His dissection of Obamacare as Obama sat glaring before him made Ryan a viral video star. Everyone on the left, from President Obama to the most insignificant troll on the most obscure DailyKos comment thread, went after him. Indeed, it was the left that made Ryan the figurehead of the GOP. But the attack backfired. GOP gains in 2010 were historic. The Mediscare tactic didn’t work. And when Republicans took control of the House in 2011, Ryan turned the roadmap into a budget plan, the Path to Prosperity. The House passed it. Republicans were on record. The GOP was the party of spending restraint, tax cuts, entitlement reform. There have been two elections since. The Republican House majority is now larger than it was in 2010. The Republicans hold the Senate. Remember the ad where a Ryan lookalike pushes grandma off a cliff? A big fail. So gripping did Republicans find this vision that the party’s 2012 presidential nominee, Mitt Romney, chose Ryan as his running mate—an implicit endorsement of the Path to Prosperity. In the space of four years, a relatively unknown congressman from Wisconsin had become the chief ideologist and spokesman for the GOP. Yes, they lost the election. But no one on the right doubted the capacity of that ticket to lead, or the seriousness of Romney and Ryan’s proposals. And the party didn’t abandon the Ryan plan, didn’t jettison Ryan himself. On the contrary: The acclamation that greeted his decision to run for speaker is evidence of the regard in which he continues to be held by conservatives. Ryan’s election as speaker would be the culmination of a long journey not only for him but also for his party. This journey began when he embraced the so-called third rail of American politics—reform of Social Security and Medicare—and refashioned it into the GOP platform. What have we learned along the way? Tackling entitlements needn’t be political suicide. Republicans needn’t dismiss the subject of poverty. Compassion, civil society—these are categories that should influence our thinking. Ideas, even controversial ones, are not hindrances in politics but boosters. They propel you to the top. We have learned that the Republican Party is in demographic transition. John Boehner is 65. Paul Ryan is 45. Marco Rubio is 44—but, he likes to say, he feels 45. Ted Cruz is 44, Cory Gardner is 41, Tom Cotton is 38, Elise Stefanik 31. Liberals are terrified of what these young conservatives might accomplish. Liberals should be. We’re approaching the end of phase one of the Ryan Revolution. Phase two? That’s where it gets interesting. This entry was posted in Columns and tagged Paul Ryan, Republican Party. Bookmark the permalink.